Why Calmkeen? We're glad you asked. Do you love using the nationally known name brand product but hate the high prices? Calmkeen is the answer. On top of the savings, we have taken Calmkeen several steps further. Calmkeen is 100% vegetarian, lactose free, soy free, gluten free, non GMO, and has no additives, no preservatives, no artificial colors, no titanium dioxide and no fillers of any kind. The national brand can't say that. Their product uses additives, fillers, titanium dioxide and is not vegetarian. 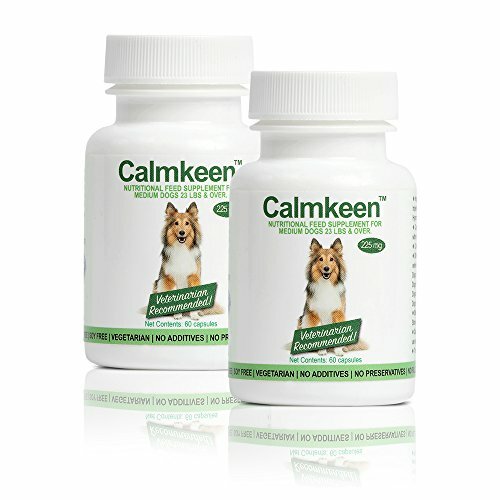 Calmkeen comes in 3 sizes. Give as recommended by your veterinarian. 75 mg for dogs and cats up to 22 pounds, 225 mg for dogs 23 pounds and up, and 450 mg for dogs 33 pounds and up. Get 120 Calmkeen capsules for about the same price as 60 of the national brand. Contains dipeptides and tripeptides for faster absorption. Calmkeen is 100% vegetarian, lactose free, soy free, gluten free, non GMO, and has no additives, no preservatives, no artificial colors, no titanium dioxide and no fillers of any kind. Nutritional feed supplement to support behavior without drugs. Veterinarian recommended. Human Grade GMP Cerified Facility. Proudly made in the USA by Americans with 100% American products. If you have any questions about this product by Calmkeen, contact us by completing and submitting the form below. If you are looking for a specif part number, please include it with your message.